Without fail, you will need to clean and wash the roof of your apartment complex at some point. 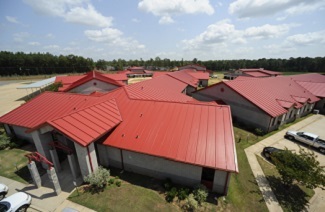 After all, the roof is the protective barrier keeping your students safe from leaks, damage and the weather outside. If you are looking for a commercial roof cleaning company who has both the equipment and knowledge of properly cleaning and washing roofs for schools and universities, look no further than the professionals at 1080 Pressure Washing of Atlanta, GA.
We work with Atlanta area schools and universities of all sizes and budgets. If your Metro Atlanta school or university has a roof that has seen better days, we encourage you to learn more about our Atlanta roof washing and roof cleaning services for schools, universities and other commercial buildings. Take your time flipping through our website to learn about our low-pressure roof washing services. We offer roof washing and roof cleaning services to schools and universities across the Metro Atlanta area.